According to GPeC statistics and estimates, together with those provided by the main Romanian e-commerce players (please find all the sources mentioned at the end of the article), the value of the online shopping industry exceeded the threshold of 3,5 billion euros in 2018, with approx. 30% more than 2017, when 2,8 billion euros were recorded. The 3,5+ billion euros value represents only the e-tail segment, meaning physical (tangible) products that were bought over the Internet. It does not include services, air tickets, holidays and travels, hotel bookings, tickets to shows or events, downloadable content etc. If they were added, the total value of online purchases would increase considerably. GPeC is, for 14 years, the most important e-commerce event in Romania. 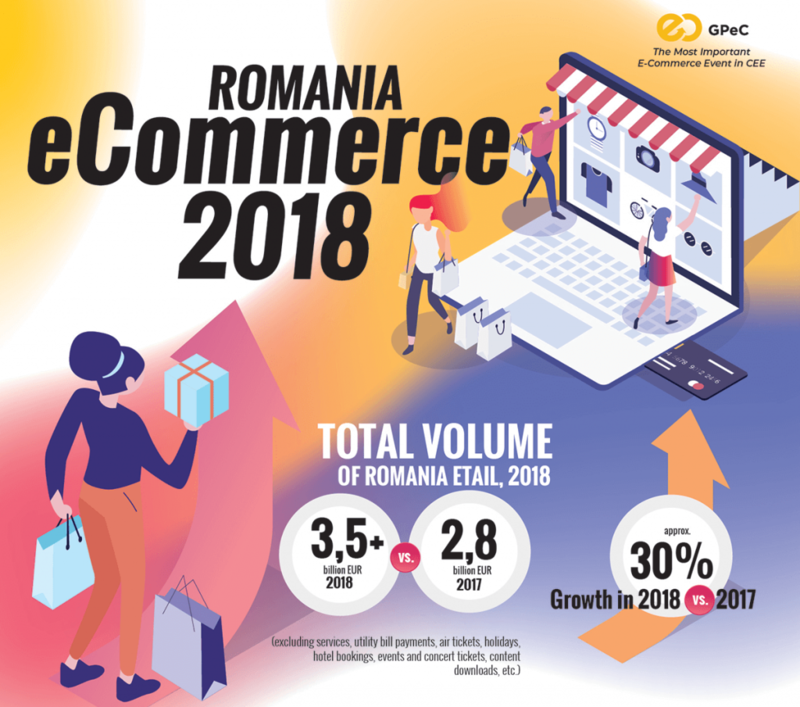 Each year, among other activities, GPeC centralizes data and publishes the Romanian e-commerce market official report. Here are the main figures and statistics for the past year. The entire Romanian retail market is estimated at approx. 45 billion euros, according to Iulian Stanciu, eMAG CEO, at GPeC SUMMIT November 2018, which means that the e-commerce market (3.5+ billion euros) represents approx. 8% of total retail, rising significantly from 5,6% in 2017 and approx. 4% in 2016. The percentage is low compared to other developed countries, but shows the huge growth potential of the Romanian e-commerce market in the coming years. 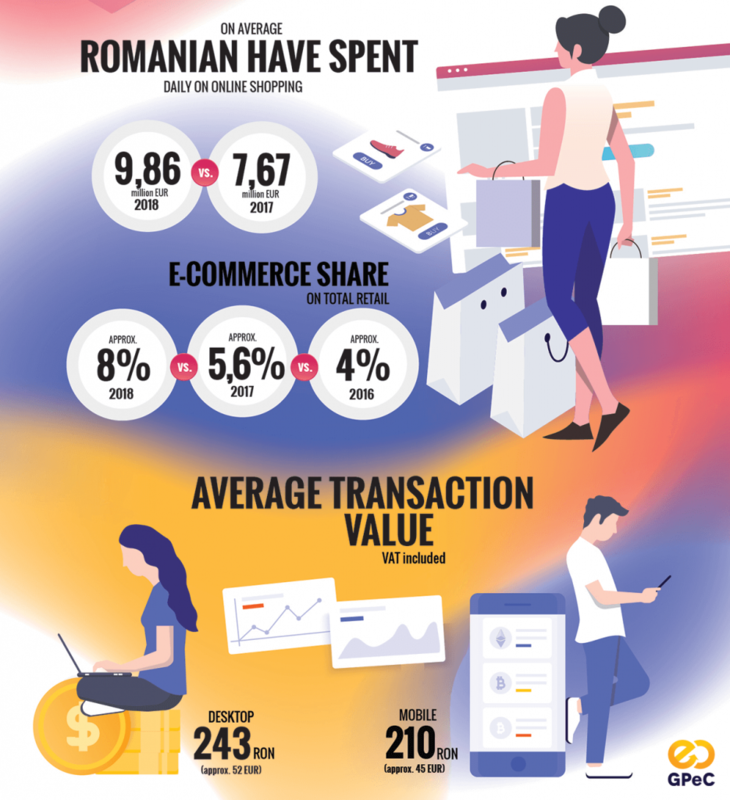 In 2018, Romanians spent, on average, 243 RON on Desktop online purchases and 210 RON on Mobile orders, according to 2Performant. Romanians are using the mobile phone a lot more to browse the Internet, approx. 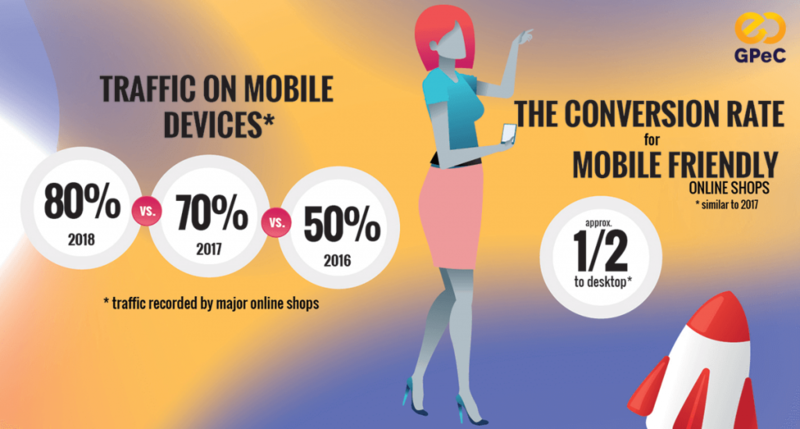 80% of the traffic recorded by major online shops being generated by mobile devices, up 10% compared to 2017 and 30% over 2016. According to the latest National Institute of Statistics (INS) report, 86% of Internet users connect online on their mobile phones and ANCOM statistics show that the number of mobile broadband Internet connections has increased considerably from 16,6 million in 2017 to 19,3 million in 2018. Compared to mobile connections, the number of fixed broadband Internet connections increased from 4,6 million in 2017 to 4,9 million in 2018. Overall, 72,4% of households in Romania have access to the Internet in 2018, according to INS data. The figure increased by approx. 4% compared to the same period in 2017. In both urban and rural areas, users access the Internet from their mobile phones, so online shops need to adapt and optimize their Mobile websites in order not to lose potential customers. However, the conversion rate on mobile devices is still half of the conversion rate recorded on Desktop for most online shops, which means that Romanians prefer to use their mobile phone to search for product specifications, but choose to complete the transaction on a computer with a larger monitor than the mobile phone screen. Exceptions apply for major online stores and those that have dedicated mobile apps, in which case, the conversion rate already exceeds the Desktop. According to 2Performant statistics, Romanians buy certain types of products mainly on mobile phones. For example, 78,5% of transaction of online shops selling children’s items are made on the mobile phone and only 21,5% on Desktop. Also, 66% of Fashion items are purchased on mobile phones, as well as 63,2% Cosmetics and Beauty products. 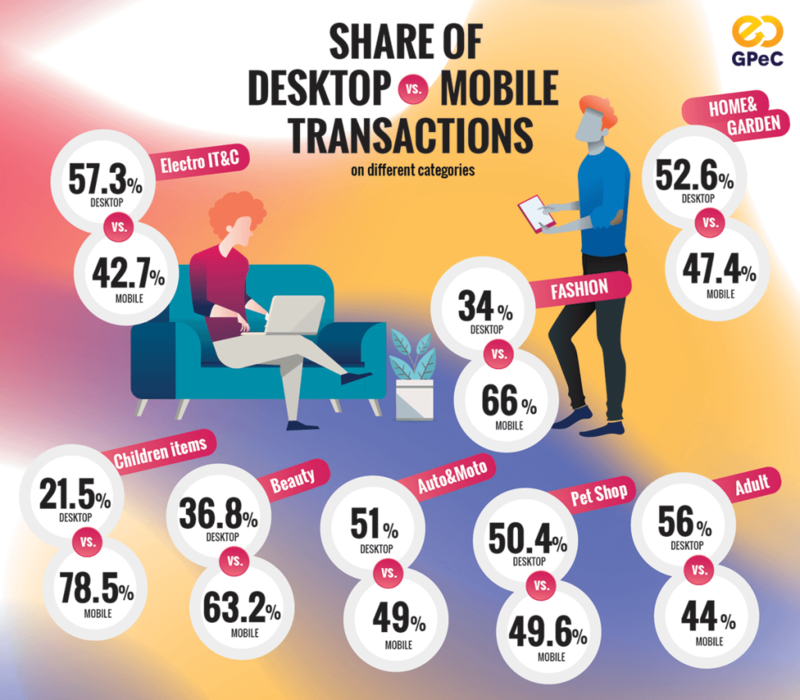 As for electronics, home appliances and IT products, Romanians still prefer the Desktop (57,3%) at the expense of mobile (42,7%), although the percentages are relatively close. The same applies to adult products (56% Desktop vs. 44% Mobile). In May 2018, GPeC together with market research company, iSense Solutions, conducted a survey among Internet users on a sample of 914 respondents – a representative urban sample by age, gender, location size and region. The study was conducted for the second consecutive year after a first edition in April 2017 on a sample of 1,012 respondents. According to the research, 53% of urban internet users have bought online at least monthly, up significantly from 44% in 2017. On average, online shoppers visit 9 stores per year, with a frequency of 3-4 times a week, while non-buyers visit 5 online stores per year with a lower frequency (1 per week). In other words, online shops are often visited even by those who did not yet make it to the checkout. The data remains unchanged in 2018 compared to 2017. 38% of all online shoppers became more impatient in 2018 compared to 2017, demanding shorter delivery times, ideally the same day they placed the order. So, the vast majority of online shoppers (90%) want feedback from online shops no later than the same day they asked a question or raised a particular issue. Children’s products (from toys to children’s items such as trolleys, clothing, consumables, etc.). As in 2017, buyers choose to buy from notorious online retailers that have the lowest prices and shortest delivery times, these being the main factors in making the purchase decision. On average, an online buyer made 9 purchases during 2018 – up from 8,7 purchases in 2017, 8,4 purchases in 2016, or 8,2 purchases in 2015. According to INS, the 16-34 age segment is the most active online shopping category, accounting for 52,3% of all online buyers. In addition, the Kantar Millward Brown study shows that 38% of Romanians have made online purchases at least once in the last 12 months, placing Romania ahead other countries like Greece and Portugal (36%), Italy (34) %), Croatia (29%) or Bulgaria (26%). “Romania’s e-commerce market grew significantly in 2018 and reveals an increased appetite for online shopping, advancing other countries and becoming a very interesting market for foreign investors who have already begun their online business in .RO. Now is the best time for any entrepreneur or company to start an online business – the market is still permissive enough and the accelerated growth trend will continue in 2019 and the following years”, says Andrei Radu, GPeC CEO & Founder. An important feature of 2018 was the increase in consumption due to wage growth. Thus, on most market verticals, the average value of a transaction has increased. Yet, even if the value has decreased, the number of placed orders has increased – which has led to a nearly 30% overall growth in the entire e-commerce market. According to 2Performant, on the Electro-IT&C segment, the average order value was 876 RON (same trend as in 2017), way beyond 2016, when the average online shopping cart value was 669 RON. Significant increases in the average shopping cart value were recorded in the Home & Garden category, from 480 RON in 2017 to 624 RON in 2018 and in online shops selling children’s items, from approx. 200 RON in 2017 to 275 RON in 2018. The average value of the transactions for cosmetics and personal care products in the Beauty category was 213 RON, while the average transaction value for products in the Auto & Moto category was 430 RON. 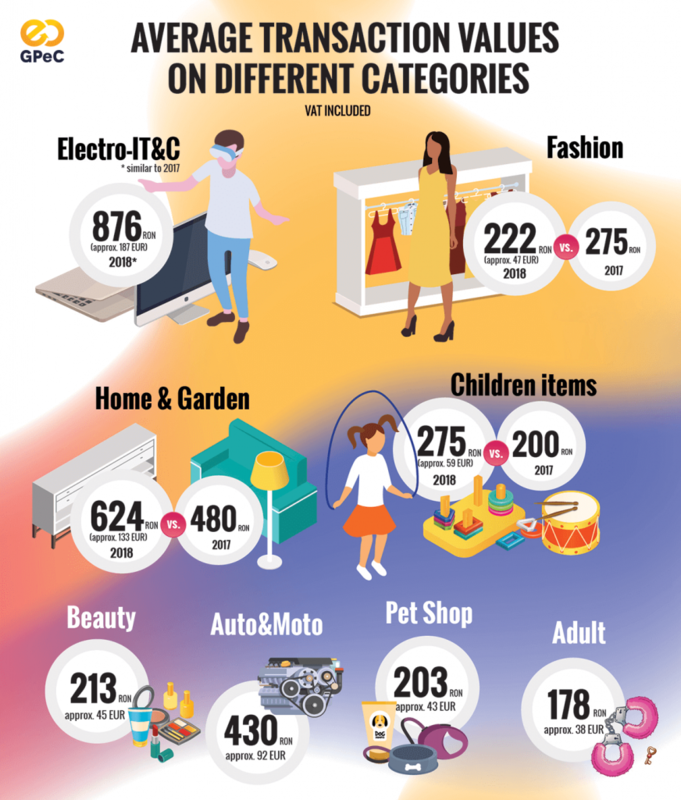 For the Pet Shop category, the average shopping cart value was 203 RON, while Romanians spent the least on products for adults, with an average transaction value of 178 RON. Fashion has seen a decrease in the average shopping cart value, from 275 RON spent in 2017 to 222 RON in 2018, but the number of transactions has increased significantly, Fashion being currently the second largest product category sold online after Electro-IT&C. Besides, the major Romanian online shops’ representatives believe that the Fashion vertical has a huge growth potential and in the following years it will become the most sold product category, surpassing Electro-IT&C. During the Black Friday campaign in November 2018, Romanians made online purchases worth over 250 million euros, approx. 30% up compared to 2017, when the value was just over 200 million euros. Black Friday sales have increased significantly YOY, from 130 million euros in 2016 and around 100 million euros in 2015 – which proves that the notoriety of the largest online discount event in Romania has increased considerably among Romanians. According to eMAG research, Romanians’ buying intention on Black Friday grew from 44% in 2017 to 51% in 2018, and the national notoriety of the event has also increased from 79% in 2017 to 88% in 2018. Black Friday sales account for 8-10% of total yearly volume sales at eMAG, according to Iulian Stanciu, eMAG CEO. Additionally, main online shops’ representatives say November and December together feature the highest number of discount campaigns throughout the year and see large sales volumes: approx. 40% of total sales over a year. Regarding the number of Romanian online shops, from approx. 7,000+ in 2017 is has more than doubled to 15,000+ sellers in 2018. The growth is remarkable if we consider the fact that in 2016 there were approx. 5,000 online shops only. Most online sellers start their business directly in Marketplaces, without necessarily having an individual online presence (a website of their own). Furthermore, according to latest research, there are approx. 35,000 websites hosted on .RO domains featuring an “add to basket” option, therefore qualifiable as online stores – their small traffic makes them insignificant in their native e-commerce landscape though. Thus, only 15,000 online sellers are relevant enough in terms of traffic and orders to be taken into account. The preferred payment method for online purchases remains cash on delivery for approx. 83% of Romanians, revealing a very slight decrease compared to 85% in 2017. According to NETOPIA Payments, the average percentage of online card payments is around 15%. The 2-percentage points difference to 100% is held by other payment methods, such as Online Banking, Micro-SMS Payments, etc. We might add that SMS payments start to gain ground mostly in parking areas where public administrations became interested in implementing this payment method. According to the GPeC and iSense Solutions’ study, the maximum amount paid by card in 2018 was 1,793 RON in Romanian online shops (21% more than in 2017) and 301 EUR in cross-border transactions. Yet, Romanians are willing to pay more for online shopping: 2,351 RON in Romanian shops and 565 EUR cross-border. According to INS, Romania’s population in 2018 was 19,52 million inhabitants. 11,7 million of them are active Internet users, compared to approx. 11 million in 2017. “For the first time, shopping is among the usual online activities performed by Romanian Internet users. The high percentage shows that the e-commerce market has grown and more Romanians are becoming accustomed to online purchases. It is a very good signal for the market that will pursue its accelerated growth rate in 2019”, concludes Andrei Radu, GPeC CEO & Founder. GPeC is the most important eCommerce event and the largest online shops community in Romania. Following its 14-year tradition, GPeC represents today the perfect mix of Conferences, Workshops, Expo, Intensive Trainings and Courses, Statistics, Community and Online Shops Competition, with the particular role of contributing to the development of the e-commerce market. Online registrations are now open for the 2019 GPeC Competition and GPeC SUMMIT May 27-28, 2019, with a 50% discount on the participation fee with the Early Adoption Offer, valid until January 31, 2019. For details and registration, visit the GPeC website.